I loved a lot of things about the apartment I found on Changle Road in October 2012. It was in the heart of the French Concession, surrounded by excellent restaurants and lovely tree-lined streets. It got a ton of sunlight (too much, sometimes!) and had the biggest closets of anywhere I’ve ever lived. The couch was ridiculously comfortable to sleep on. The apartment was small, but a good size for one person, and for the most part, I enjoyed a very pleasant year there. However, there were also several things that limited my love for the place—chief among them the nonstop, tooth-rattling drilling as my neighbors renovated their own apartments as mine had been. Since I work at home about half the time, construction from 8am(ish) to 8pm(ish)* posed a big problem, and on several occasions I actually shrieked at the ceiling, “Will you please STOP!? !” There was also a recurrent mouse problem that I couldn’t vanquish, no matter how much I cleaned. And the musician next door was a nice guy and a wonderful piano player, but his attempts at the violin (or erhu?) sent chills down my spine. When the landlord informed me that he was going to raise the rent from 6000RMB a month to 7000, I immediately replied that I would move. I loved the apartment, but not that much. So after nearly two months in the U.S., I returned to Shanghai late on Wednesday night and set about looking for a place to live pretty much immediately. I started on Craigslist, checking the listings for apartments in the neighborhood I had decided would be most convenient for me (on Line 10 of the subway, west of the Shanghai Library station, for those of you who know Shanghai). I found a few suitable candidates and realized that they were all posted by the same realtor, who called himself Eric. I sent him an email and described what I was looking for: easy access to Line 10, one or two bedrooms, relatively quiet, and an absolute maximum rent of 6000RMB/month (actually, my max was a little higher, but I decided Eric didn’t need to know that). He replied quickly, and by 1:30 Thursday afternoon—16 hours after my plane landed—I was standing on Dingxi Road in the rain, waiting for Eric to show up. 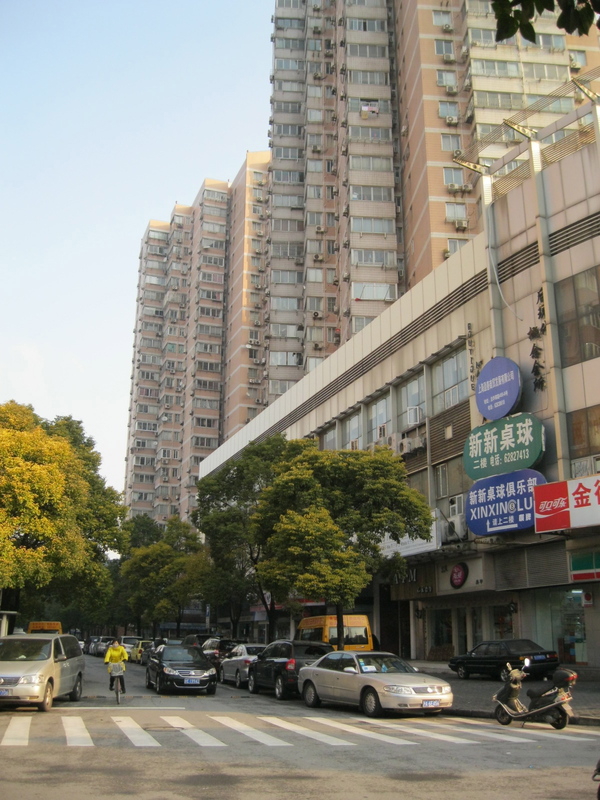 The Hai Fu apartment complex, viewed from Fahuazhen Road. He didn’t, but he sent a colleague (I’ll call her Nancy, as she wore an impressive pair of boots) to show me the three apartments he had to start with. The first was dank and dark, the third was on the sixth floor of a building without an elevator (I appreciate exercise, but with groceries? No), and the second was just right. Almost—it’s a little bit farther from the subway than I’d like. But otherwise, it’s very much what I expected to find: a two-bedroom apartment on the top (24th) floor of a high-rise in the “Ocean Wealth” ( Hai Fu 海富) complex, which is pretty typical of late-90s construction, meaning it probably looked shabby and run-down within a year of completion. The building exterior is covered in white and peach bathroom tiles, the elevators are tiny and slow, and there’s a coterie of sixty-something men who seem to spend their days smoking and people-watching in the lobby. The apartment itself, however, has a lot to recommend it: I finally have a home office/guest room, which was really important to me, and the living room is a a good size, meaning it should be easier for me to have friends over than it was on Changle Road, where the living room was too small to seat more than three people comfortably/non-awkwardly. I signed the lease on Friday and moved in on Sunday. One thing I really appreciate about renting apartments in China versus the U.S. is that the actual rental process is much, much easier. Before living here, I had worried that it would be difficult for me as a foreigner to rent an apartment, but it turned out that all I needed was a hefty stack of cash and my passport. No background check, no credit check, no requirement that I demonstrate proof of income (which is a nightmare as a grad student/freelance writer). Can I produce cash and do I exist—those are the only things my landlady wants to know. View of Changning District from the window next to the elevator bank on my floor. 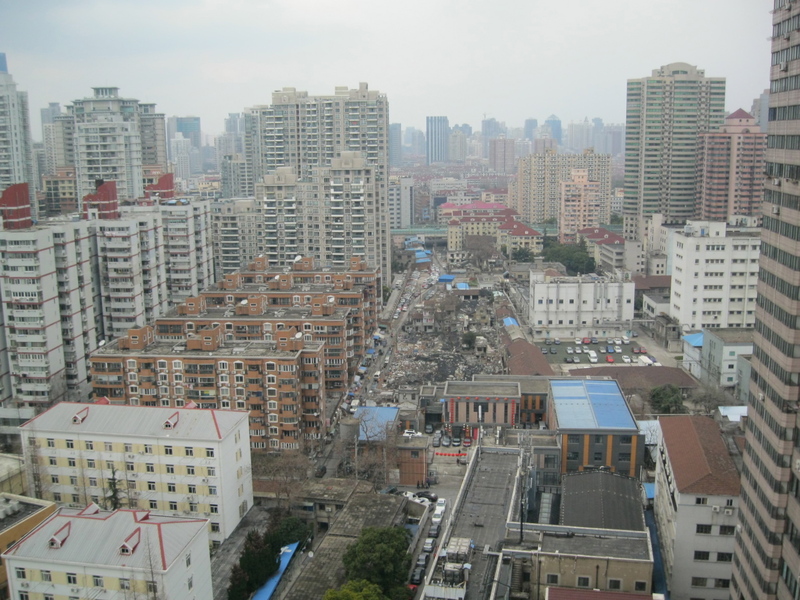 So this is the first piece of writing I’ve done while sitting in my new home office, looking out over the grim results of Shanghai’s high-rise construction boom in the 1990s. It’s not the most impressive sight, and perhaps that’s why Nancy the realtor looked so confused when I joked about living in “the penthouse.” Most people, if given the option, would pay not to have this view. But I’ve been here two days so far and haven’t heard a single power drill or screech of the erhu, so in my book, this definitely qualifies as moving on up. * I’ve been told that Shanghai municipal laws limit construction to these hours. In my experience, crews will stretch the boundaries a bit and work 7:45am through 8:30pm, seven days a week. Glad you’ve got a spare room/office. Write like the wind!